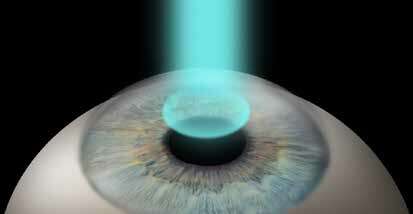 The procedure that originally made wide use of the excimer laser was photorefractive keratectomy, abbreviated PRK, first performed in 1987. Like LASIK, PRK is a refractive surgical procedure that uses an excimer laser to reshape the cornea. However, rather than creating a flap, as in LASIK, and then reshaping the deeper corneal layers, PRK uses the excimer laser to sculpt directly on the surface of the cornea. In PRK, the epithelium (the clear skin covering the surface of the cornea) is removed. This exposes the stroma. The laser then sculpts away the stroma tissue to correct your vision (Figure 19). The epithelium grows back to cover the cornea again over the next three to four days. You can think of PRK as LASIK without the flap, which is why I like the term flapless LASIK. The message of this chapter is that PRK and LASIK are very similar. Rather than duplicate much of the material in the LASIK chapter, I refer back to that chapter frequently in this chapter on PRK. If you skipped the chapter on LASIK and came directly here, I recommend you go back and read the LASIK chapter first. Yet, there are differences between PRK and LASIK, the main one being that PRK has a slower recovery than LASIK. Your eye will often be sore for three or four days after surgery while it heals. I give my PRK patients numbing eyedrops to take home to use if their eye hurts. Your vision will be fairly blurry for about a week while the epithelium heals, and perfect vision often takes a month or longer to achieve. In the long run, though, the results of PRK and LASIK are the same because they are very similar procedures performed with the same laser. Figure 19. In a PRK procedure, the surgeon gently removes surface tissue covering the cornea rather than making a flap. Then, the excimer laser sculpts the cornea, to correct nearsightedness, farsightedness, or astigmatism. In general, our patients prefer LASIK for the faster recovery. We reserve PRK for those people who aren’t optimal candidates for LASIK. PRK is referred to by a number of different names. If you search the Internet, you’ll find it called epi-LASIK, surface ablation, or LASEK. I prefer either PRK, the scientifically correct term, or flapless LASIK, which is most descriptive.